"Latin American affairs are not a certain country's exclusive business. Nor is Latin America a certain country's backyard." This a none too subtle rebuke to Trump's national security adviser John Bolton having said, "The US will not tolerate hostile foreign military forces in the Western Hemisphere". Well John they're here. 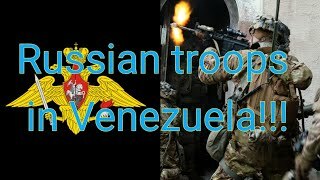 Chinese forces along with Russia having sent a 100 of its own military forces to Venezuela on March 23. Of course it's not only Bolton but also Trump himself, Secretary of State Mike Pompeo, special envoy to Venezuela Elliott Abrams all hyperventilating telling Russia to get out of Venezuela. However, this move by China, along with Russia, is a clear repudiation of the Monroe Doctrine making it plain the US no longer has the final say in what's going to happen in the Western Hemisphere. This not to say 100 or so Chinese and Russian troops in Venezuela constitute a formidable military presence in the country. They don't. Yet their mere presence makes it highly unlikely any US or proxy led mercenary military operation is likely to occur any time soon. It might force the US to reevaluate its plans to overthrow President Nicolas Maduro and bring regime change to Venezuela. Now whether Russia and China placing their troops in Venezuela was a coordinated effort is not confirmed. Considering the two are now close allies, having been sanctioned and provoked by the US-NATO on the doorstep of Russia and a US trade war and provocations against China in the South China Sea-the Russian and Chinese military presence in Venezuela does constitute a sort of "turning the tables" on the US. So is this a watershed moment in world affairs; Venezuela being the redline whereby Russia and China will not accept a US overthrow? Maybe. To this observer Venezuela has felt different. With the world's largest proven oil reserves a US takeover would effectively control the supply and demand of the world's oil placing it firmly under its hegemony. Both Russia and China have significant financial interests in Venezuela, China some 62 $billion repaid in oil and Russia 17 $billion in loans and investment. So they're not about to cede those interests to a US committed to bringing about regime change and the overthrow of Maduro. It should not be lost that Russia coming to the military aid of Assad in Syria in 2015 saved that country from falling into the hands of a US backed, mercenary jihadist al Qaeda and ISIS regime. So Russia saw its efforts in Syria could effectively counter US machinations in that country. Can Russian and Chinese efforts do the same in Venezuela and stop the US in its tracks? Who is to say. A week ago OPEDNEWS posted Andre Vltchek's latest article, "Like Libya and Syria, Venezuela is Not Just about Oil", truly a must read. Vltchek ended it saying of Venezuela, "Therefore, this is all far from being 'just about oil', it is about survival of our planet". Venezuela may yet prove that to be the case. Could play out as a "Twilight's Last Gleaming" scenario!